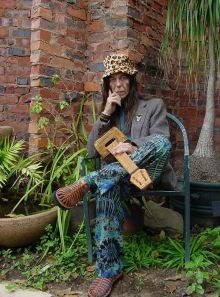 Afro-Saxon minstrel poet, guitarist and singer song-fighter SYD KITCHEN has been a dynamic, innovative contributor to the South African musical landscape since the ‘70’s. The Durban based artist’s often biting lyrics and crafty guitar work have earned him a dedicated following at Festivals and Clubs throughout SA; be that as a solo performer, with the AQUARIAN QUARTET or with Madala Kunene in BAFO BAFO. He is the only artist to have performed at every Splashy Fen Festival since its inception in 1990. His collaboration with Playwright/Actor GREIG COETZEE, “Johnny Boskak is Feeling Funny” travelled to the 2006 Edinburgh Festival where it was awarded the Scotsman’s Fringe First Award; one of only 15 awards given to over 9000 Fringe acts and is booked for a 6 week tour of the UK in early 2008. Visit www.sydkitchen.com and www.myspace.com/sydkitchensa for a cultural rinse and tuck.